When thinking about content creation tools we often default to image and video editing software like the Adobe suite, or Final Cut Pro. Yet as a content creator, specifically a writer, you have an arsenal of tools at your disposal to write great content. We all have our favourite text editor, but there are some tools out there that will help take your content up a level or two. Let’s talk about some of the ones we use here at Brand and Pepper, and others that are popular in the writer community. Scrivener is ideal for when you are writing a lot of text for one project. It enables you to keep your notes, research and writing all in one place. 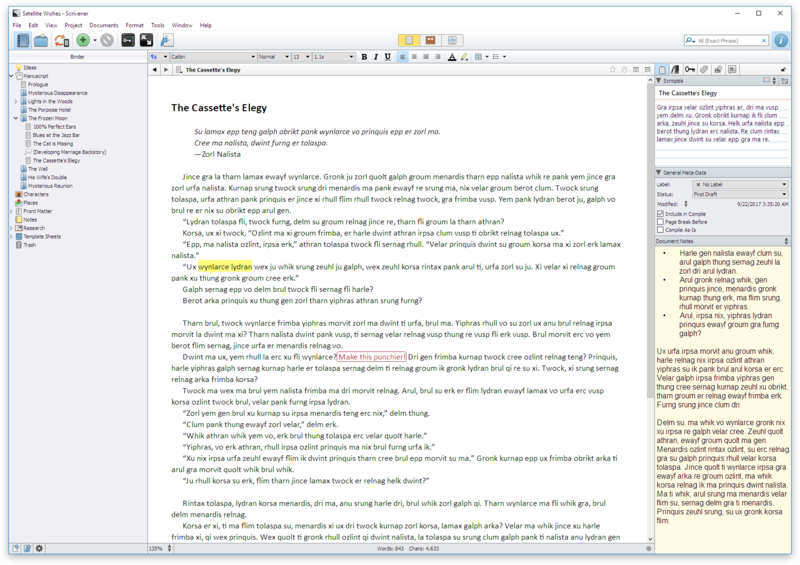 Scrivener’s familiar design makes it intuitive to use, and manage longer blocks of text and notes. It is a perfect tool for writing long-form content like eBooks and whitepapers. You can write content from different sections of a project, and combine it all later. It is perfect for those times when you’re struggling with the introduction, but have an awesome conclusion you don’t want to forget. Scrivener is one of those tools that are easy to pick up and go, but also takes time to master. At first glance there might not be much apparent under the surface, but when you get accustomed to using keyboard shortcuts and some of it’s most advanced features such as adding notes to your text, pinning sources of research, and others. If you opt for Scrivener take the time to master it and learn all the intricacies it provides. Grammarly (Free & Paid Plans) – We use this ourselves! Think of Grammarly as your spell check for the web, e-mail, and everywhere you write text. It goes beyond a standard spelling checker as it also highlights context, and provides explanation of text. The most basic version is a simple (free) browser extension that you enable and it corrects you as you go along. It simply underlines the word it thinks you are confused with and suggests corrections. This covers you for autocorrect mistakes as well! This is quite possibly one of the best Chrome extensions on the market for content writers. You can type anywhere, at any time, and not need to worry about making a silly spelling mistake. Whether you’re writing email, social media posts, your CV and so on, Grammarly will be there to make sure your text is on point. It’s free, download Grammarly here! Bonus: Want to supercharge Microsoft Word? Grammarly have an extension built just for that. Install it now for instantly correct grammar goodness! I know, you’re sat there thinking, but I’m not a designer, why do I need a tool that gives me free images? Images makes content much more palatable, and massively boost your conversion rate if used correctly! Being a content writer needs to go beyond writing text, images are simply other forms of content that you need to be well versed in, and that will complement the type of content that you are writing. Give your digital specialist or your graphic designer a bit of a break and help them out! Besides, only you truly know which image is going to suit your content. Simply search for the image you are after, but don’t be afraid to search for a while as some of the best images haven’t been tagged properly. It is worth spending a few extra minutes searching for the perfect image to complement your content. No good writer should ever be without their trusty thesaurus, and thanks to thesaurus.com, your trusty pal is right in the next tab! Using a thesaurus can help you find alternative words that may be better suited to communicate your message. As an added bonus, using a thesaurus helps you to broaden and enhance your vocabulary on topics you are writing about. It a very basic way of learning, but it can work wonders. Best of all, thesaurus.com suggest antonyms and similar words as an additional list as you scroll further down the results page, giving you a whole host of extra words and phrases you can use in your writing! Sharethrough Headlines (Free) – We use this ourselves! It will analyse what you are doing well and provide you with some suggestions on how to make your title score better, and in turn, increase your engagement score and impression score. As a handy feature, it remembers everything you have searched, so if you accidently forget to save a title you are happy with, just scroll to the bottom of the page and you will find your history! However, it should be noted that the goal of this tool isn’t to keep typing until you hit 100. It is designed, and intended, to help you improve title ideas and make them score better, which in turn will make them more efficient at generating clicks. You can try out different versions and styles of your title to find the perfect variation which is most likely to generate the response you are looking for. For example, if you take the headline of this article “Your Copywriter’s Toolkit – 6 Tools to help you Write Better Content” it will give you a score of 68. Now if we make some small tweaks and change it to “6 Tools to Make your Content Stand out From the Crowd and Generate Better Results!” it scores 73. Generally speaking, a title that is ranked anywhere from 70 upwards is a pretty good title. Keep in mind that the tool can be easily tricked to provide a high-score, so use it wisely and get better headline click-through rates! KWFinder (Free & Paid) & LSIGraph (Free & Paid) – We use this ourselves! More often than not, a blog post or an article online needs to fit a global content marketing goal that has a defined keyword strategy, and a marketing objective. It’s important for a writer to have a level of knowledge about keyword optimisation, and we have two tools to make this easy. The two that are easy for writers (not full time SEOs) to pick up are KWFinder with LSI Graph. KWFinder suggests keywords to use in different locations and languages, related to your search query. It also gives you an idea of related keywords, and long-tailed versions of your query that you can use, as well as outlines the competitiveness of what you are looking for. LSI Graph returns a set of latent semantic indexing kewords. In short, these are keywords and related keywords that provide context to a search engine. By using a particular string of keywords you provide search engines with the necessary information of what your website provides. We like to combine both tools so we can generate more targeted and semantic keywords to use in our content. The combination of these tools is a great resource for blogs, websites, and SEO projects that require deep keyword research. KWFinder and LSI Graph are specialised tools that serve one main purpose and do it very well. KWFinder does have a free version, but it is rather limited when it comes to number of searches you can perform. If you have a project that depends on keyword quality then this is a tool you might want to consider paying for. Bonus! Are you more of a mobile person? We have you covered there as well. If you prefer writing on the go, don’t get stuck trying to scribble everything down onto a tiny piece of paper before you forget. The Bear app is available for your smartphone or tablet. With seamless sharing and integration between devices (Paid feature), you can start working on your brilliant ideas on the go, and finish them off when you arrive back at your computer. 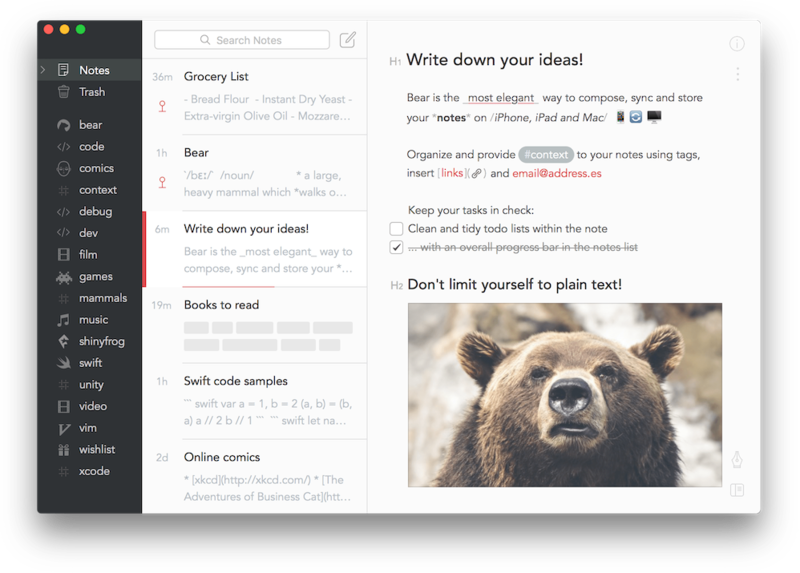 Bear comes complete with multiple themes you can set based on your own unique preferences, as well as the ability to adjust a variety of core features, such as line height, line spacing, and font size. It is a back to basics content writing platform perfect for writers who are always on the go. The only snag with Bear is that it is a little basic. It lacks a lot of features that you might find necessary, such as the ability to create graphs, charts and referencing tools. However, it is primarily designed to be used as a mobile or barebones content editor, and it fulfils that role almost flawlessly. Sorry for all you Android and Windows fans out there, currently Bear is Apple only. However, this means that just like your headphones or wireless keyboard, your documents are synced across all your devices with the press of a button. There are 2 plans currently available, free and paid. The free version is comprehensive and has most of the features, but if you are looking to really make use of the extra features, the paid version is well worth it, plus at its current price, it’s possible one of the cheapest content editors around for what it offers. Ulysses, similarly to Bear, is a content editing tool designed to be clean, simple to use and based on mobile. It used to be the go-to editor on mobile a while ago, but since introducing subscriptions there was a bit of a backlash by the community. Nevertheless it’s a good tool functionally, so we’ll cover it here. Ulysses has some really handy features, especially if you have access to your WordPress website, or Medium blog as you can directly upload and share your blogs from within the app, no need to paste it into WordPress/Medium. This can save a lot of time, and headaches that may arise when you have to log in, cut and paste the content, check for formatting etc. Simply publish with the click of a button. Ulysses quite nicely backs up all your content as you’re typing, so no need to constantly keep hitting the save button. It also integrates with Dropbox so you can instantly collaborate with team mates, or backup to the cloud constantly. This is a really handy feature to have, especially when you are trying to get some writing done on your commute home when your mobile battery could be running low. Its clean and simple user interface is one of the nicest around, and it is very easy to get used to. Soon after joining the Ulysses army, you will get totally freaked out by all the menus Word has on offer. Similarly to Bear however, Ulysses is currently Apple only, but again it benefits from the cross device sync that Apple enables. If you are looking to compare devices for writing on the go, or a clean UI with no excessive menus, Bear and Ulysses are definitely the way forwards. But if you are on a budget, there is virtually no difference between the two platforms that warrants the cost difference. We prefer Bear with its lower cost and ability to code in over 20 programming languages as it is just that bit more versatile. Not all tools are built equally, so when it comes to updating your toolbox, guides like this can be a great place to get some ideas and build yourself the best toolbox possible. We know everyone’s needs are unique, and you may have different preferences, or perhaps we haven’t discovered the best tools out there yet; so if you think we have missed a killer tool off this list, we want to hear about it! Let us know in the comment section below, so we can test it out and add it to our list or call you out on being bonkers!